My current research interests focus on developing theoretical and numerical methods for understanding the phase behavior and structures of block copolymers, polymer brushes and polyelectrolytes both in bulk and under geometrical confinements. During the PhD period, my research focus was conducting both experimental and theoretical studies to elucidate the fundamental mechanism of polymer crystallization, using monolayer crystals of low molecular weight poly(ethylene oxide) (PEO) fractions as a model system. Block copolymers represent an important class of polymeric materials that can self-assemble into complex microstructures on the scale of 1 to 100 nm. Confining block copolymers in geometrical environments introduces additional parameters, which leads to an even richer set of nanostructures, making it an attractive route for a wide range of applications including nanolithography, nanotemplating, nanoporous membranes, coatings, and biomaterials. I have conducted a comprehensive study of the confining system of block copolymers, including development of highly efficient numerical tools, the surface states of polymer brushes which are often used to modify substrate properties, development of a model to describe the interaction between the modified substrates and the block copolymers, thermodynamic and kinetic aspects of directed self-assembly (DSA). The surface interaction between substrates and block copolymers is one of the most important factors that control the alignment of self-assembled domains under thin film confinement. Most previous studies simply modeled substrates modified by grafting polymers as a hard wall with a specified surface energy, leading to an incomplete understanding of the role of grafted polymers. 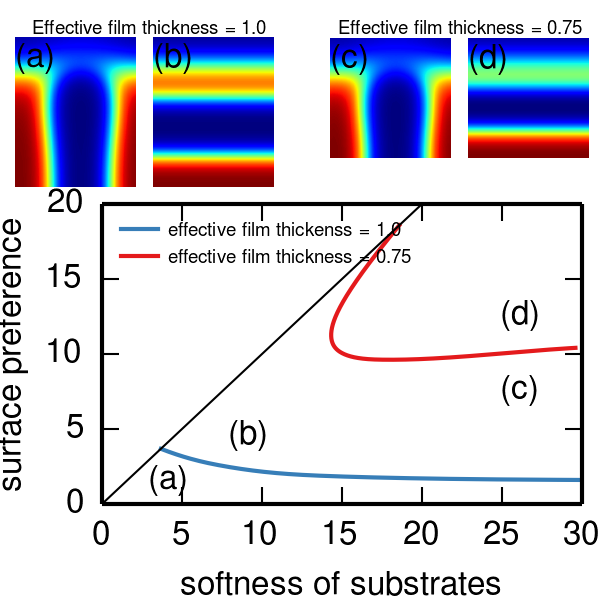 We proposed a general model of surface interactions where the role of grafted polymers is decomposed into two independent contributions: the surface softness ($\gamma$) and the surface preference ($\delta$). With this separation, we elucidate the connection among bare hard wall confinement (SST), hard confinement modeled by the “masking” technique, and soft confinement. Soft confinement reduces to the mask hard confinement at large $\gamma$ and to the SST hard confinement in the limit of $\gamma\to\infty$. It is also possible to map the soft confinement model using ideal random copolymer-grafted substrates onto our model. Hence we believe that this separation of surface interactions into two independent parts are universal as long as no internal phase separation occurs across the confining wall itself. Directed self-assembly (DSA), which utilizes chemoepitaxy or graphoepitaxy to guide the microphase separation of block copolymers (BCPs), is a competitive next-generation lithography candidate for electronic industry. Based on this technique, large scale defect-free ordered nanostructures, have been successfully produced on patterned substrates in experiments. In general, sparsely patterned templates are preferred because the template is produced by photolithography whose cost is proportional to the resolution of the template. However, the directing ability of the template weakens as the pattern in the template becomes sparser. Consequently, it is impossible to reduce the cost by lowering the resolution of the template without limitation. Inverse design is an emerging concept in materials design that the desired functionality of the new material is declared first and theoretical or numerical calculations are then used to predict which stable compounds/molecules exhibit the required functionality. The common approach for tackling such inverse problems is converting them into optimization problems and optimization methods (such as evolutionary algorithms) are employed to solve these problems. One major issue of this approach is that the optimization method has to be rerun once the desired functionality is changed a little. To settle this issue, we propose a machine learning approach based on deep learning and neural networks for inverse design. One of the advantages of the machine learning approach is that once the model is trained, we can use it again and again. Note that the predicting stage of the machine learning is blazing fast. Thus it can save tremendous amount of computational time in practical applications. 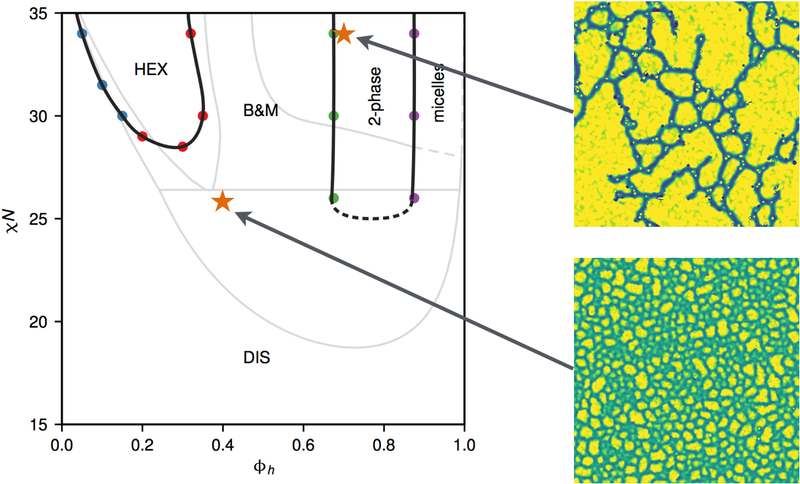 While SCFT achieves remarkable success in modeling self-assembly of block copolymers, it is a mean-field theory which ignores the fluctuating effects. 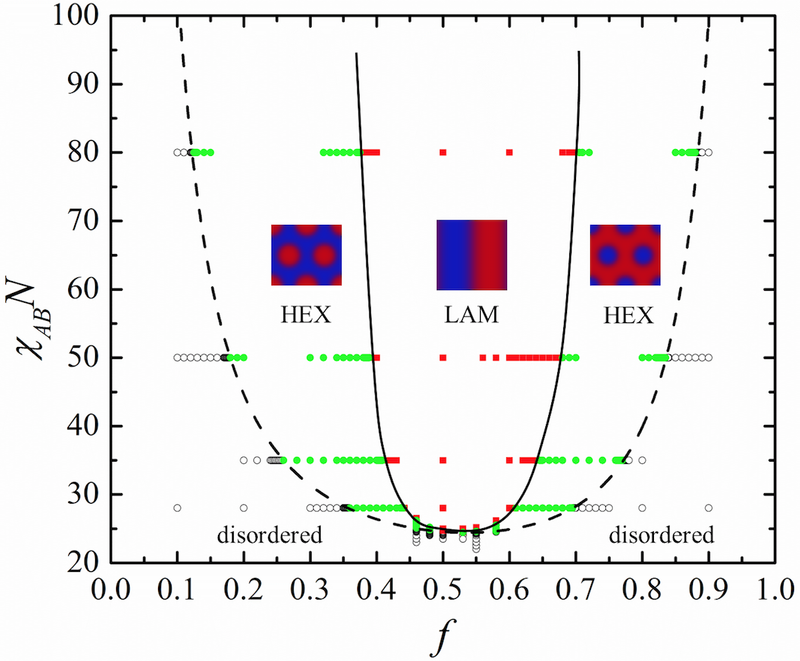 Using beyond mean-field field-theoretic simulations to study fully fluctuating polymer systems remains a big challenge. Current field-based approaches are highly computational demanding which renders it infeasible to tackle large-scale problems. In collaboration with Prof. G. H. Fredrickson at UCSB, we propose a density functional model that can incorporate thermal fluctuations to describe polymer solutions. Meanwhile, it can cut the number of dimensions of the computational space from 4 to 3, leading to a reduction of computational cost for about two magnitude. Using the same strategy for developing the model of polymer solutions, it can be generalized to other polymeric systems such as block copolymers. to provide new evidence to better understand the nature of polymer crystal-lization. Based on statistical thermodynamic analysis, we predict that the thickness of amorphous layers of IF(0) crystals increases with temperature, which is confirmed by crystallinity measurements and small angle X-ray scattering (SAXS) experiments. The melting behavior of PEO monolayer crystals on mica surfaces was studied by AFM. Taking account of the linear decrease of fold surface free energy with temperature, we have shown that the relations between melting points and thickness and/or fold number can be described by a modified Gibbs-Thomson equation. The end group effect on the melting behavior of the monolayer crystals was also analyzed. 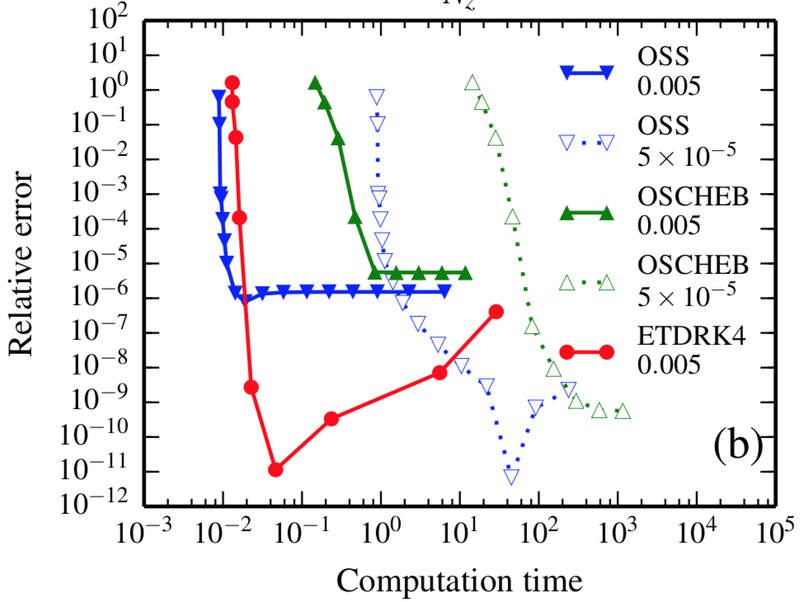 As an important part of my research work, I have developed several computational software packages and implemented numerical algorithms to perform computational tasks encountered along research. Programming languages involved: C/C++, Matlab, and Python. Transition to Julia Planned. Chebyshev collocation method for SCFT calculations of confined polymers. Pseudo-spectral method for SCFT calculations. Multigrid method for SCFT calculations of charged polymers. 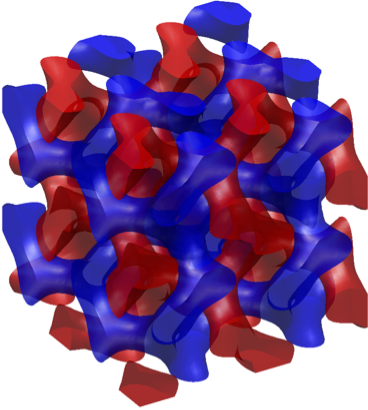 Off-lattice Monte-Carlo simulation of polymer crystal growth. Phase-field simulations of thin film polymer crystal growth.